When monitoring surface temperatures, speed of response and minimal heat-loss is critical to obtain accurate temperature control. Thus the thermal mass of the surface temperature sensor should be as small as possible, combined with suitable thermal insulation where required. ATC Semitec offer a range of NTC ring surface temperature sensors in plastic, metal and plastic/metal fittings to suit your application. 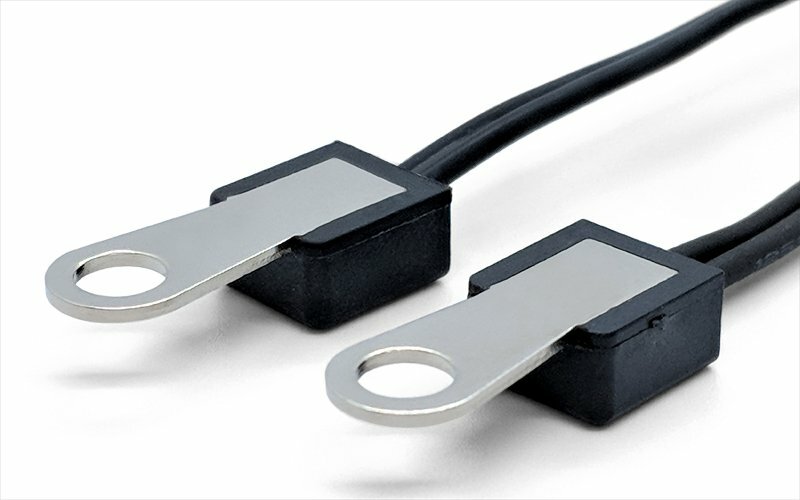 Thin-film JT NTC thermistor sensors offer very fast-acting response for electronics, air-sensing and medical applications; similar leaf-style high temperature sensors offer control accuracy up to 250°C in office automation products. Pipe-clip surface temperature sensors can monitor internal fluid temperatures from the outside of the metal pipes on which they are located. Pipe diameters from 12mm to 28mm can be measured with accuracies as close as ±1K and thermal response times of less than 1 second. These are just some of the standard surface sensor designs in the ATC Semitec range. Call us today on 01606 871680 to discuss your application’s thermal sensor requirements. Using our extensive technical knowledge and innovative supplier base, we will work with you to provide the optimum solution for your product. IP67 rated pipe-clip temperature sensor from Semitec. Ideal for gas-boilers, instant water heaters and anti-legionnaires monitoring systems. Suitable for pipe diameter 12-22mm. High temperature flexible thermistor suitable for use in sensing high surface temperatures up-to 250°C. Typical applications include use in- laser-printers; photo-copiers; fax machines etc; hot plates and appliances.